Italian police on Thursday arrested a priest accused of pocketing €4m (£2.76m) from a Catholic hospital he ran and helping run up €600m in debts that forced it into bankruptcy. 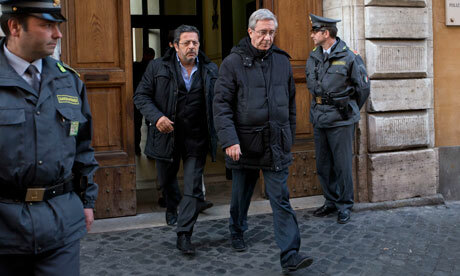 The Rev Franco Decaminada, who until 2011 was the chief executive of the IDI dermatological hospital in Rome, was placed under house arrest by Italy‘s financial police. They also detained two other people while seizing a Tuscan villa that police say Decaminada built with stolen money. The plight of 1,500 IDI workers who haven’t received paychecks for months had prompted Benedict XVI in one of his last acts as pope to name a delegate in February to take over the religious order that owns the hospital to try to bring it back to financial health. But in the end the Vatican refused to provide any financial assistance and last week a Rome court certified the hospital as insolvent. IDI workers have occupied the hospital’s management area and are buying food to help needy co-workers while continuing to work without pay in hopes of saving their jobs. “After years of suffering and eight months without salary, we at least have the satisfaction of seeing that justice is starting to work,” Bartolomeo Di Gregorio, 56, a biomedical lab technician, told the Associated Press on Thursday. He welcomed the arrival of Cardinal Giuseppe Versaldi as the papal delegate to head the religious order – the Congregation for the Children of the Immaculate Conception – which runs the hospital, but said in the end it didn’t help “because we went into bankruptcy anyway”. The problems at the IDI are the latest in a series of financial scandals at Catholic-run health facilities in Italy that, while not directly involving the Vatican, have links to its No. 2, the secretary of state, Cardinal Tarcisio Bertone. According to leaked Vatican correspondence, Bertone looked into investing money from the Vatican bank into a failing Milan hospital, the San Raffaele, in 2011 after it accumulated millions in debt because of mismanagement. In the end, the hospital went to outside investors. But Bertone’s apparent interest in building up a Vatican healthcare network in Italy has been cited as evidence of his own administrative failings in running the Holy See by focusing too much on small Italian problems and not on global church issues. On Thursday, Decaminada’s order sought to distance itself from his crimes, saying it was a victim in the case and it was co-operating with investigators. It stressed that “no member of the congregation ever saw or visited the home in Tuscany built by Father Decaminada” and its construction was never authorised. The FBI has joined the investigation of possible fraud at St. Thomas More Catholic Church. The Archdiocese of Detroit barred Rev. Edward Belczak, pastor for 29 years at the parish, from all his parish duties this past January. Joe Kohn, director of public relations for the Archdiocese of Detroit, said the discovery of Rev. Edward Belczak’s financial transactions in question came to light during the annual archdiocese audit in June. He explained that, under canon law, Belczak, 67, may not say Mass, hear confession or perform any other function at St. Thomas More; he remains a priest and is able to say Mass elsewhere. The archdiocese and Troy police and FBI are investigating charges that Belczak took $92,000 in excess of his allotted compensation throughout the last six years. The pastor allegedly accepted and directed more than $16,000 in funds to himself from parish accounts over the last six years, and he allegedly paid $240,000 to a “ghost employee” during the past six years. Belczak is accused of fraudulently charging the parish for $26,000 in medical and dental coverage over the last six years. He allegedly authorized a long-term $20,000 disability policy for one parish employee, but not other employees, and allegedly funded the parish travel group as a parish-related activity but did not disclose or report any financials for the group and accepted but not did not deposit to parish accounts $25,000 in commission checks for the group. He allegedly did not record or deposit funds from special collections for Mother’s Day and Father’s Day, and allegedly did not record more than $10,000 in cash found in a parish employee’s desk. “We continue to work with civil authorities on the matter,” Kohn said. The archdiocese has appointed Monsignor John Zenz, vicar of the Northwest Region and pastor of Holy Name Parish in Birmingham, as administrator of St. Thomas More. Kohn said that according to Catholic Church canon law, Belczak will have a civil hearing with an advocate representing him in the case, which will be heard by a canon lawyer in another Catholic diocese. The Archdiocese of Detroit is the sixth largest diocese in the country, and St. Thomas More is one of five Catholic Churches in Troy. Kohn said that someone would also represent the archdiocese during the proceedings. He said that, typically, proceedings of this type take place through filings — a matter of responding to documents back and forth, rather than sitting in a courtroom. He explained that the priest who oversees the process will present his findings to Archbishop Allen Vigneron, and the archbishop will decide whether and how to act on them. The priest who oversees the process would be from outside the Archdiocese of Detroit, Kohn noted. Kohn said he could not say who was serving as Belczak’s advocate. Belczak could not be reached for comment. Belczak attended Sacred Heart Seminary, Detroit, and St. John’s Provincial Seminary in Plymouth, and was ordained as a priest in 1972. He served as associate pastor and co-pastor at National Shrine of the Little Flower in Royal Oak from 1972 until 1980, and as associate pastor at Our Lady of Sorrows in Farmington from 1980 to 1984, when he became pastor at St. Thomas More. You can reach C & G Staff Writer Terry Oparka at toparka@candgnews.com or at (586)498-1054. I am sick of reading about the financial and sexual antics of the clergy..This is only the tip if the iceberg; how many incidents are not reported or even talked about; the best way to tackle this problem is not to bury one’s head in the sand but to tackle the problem head on; let them get married and pay them a proper salary with perks and fringe benefits like any senior executive in the commercial world, because after all they are doing a “JOB”; Let’s call off this rubbish of it being a vocation or a calling from God; IT IS ABSOLUTELY A GOOD CAREER OPPORTUNITY for those who otherwise would not have been of any consequence, and could not have made it in any other sphere of activity in this world; wake up call long gone by, for the cronies who sit in Rome and pontificate about virtue and make all the rules. Priestly celibacy has been the biggest headache for the Church, since most see it as being unnatural and against, what has been created by God himself.